I just purchased 2 Almonds, can one be used as the router and the other as an extender. I have had problems in the past with other extenders competing with the router if they are not the same brand. This shouldn't be a problem at all. I personally use multiple Routers (5 in total) in my home. I have my Primary Router doing normal Routing etc, issuing IP addresses via DHCP, and registering all my client devices, (both "wired" and "wireless") in the DNS Server on the primary Router. All the remaining Routers are configured as "wired" WAP's, including my Almond. Whether you use your second Almond as a "Range Extender" or as a "wired" WAP, the configuration is quite similar. (I favour a "wired" configuration, so that the "radio" is available to my clients devices, but the setup for "Rainge Extender" can be easily accomplished, even without a PC, simply enable the "Range Extender" option via Touch Screen, and it will setup a new SSID on the Almond of "original-SSID_Almond". If you like having two WAP's (Wireless Access Points) on different SSIDs, (so that you can choose which one to connect to), then you'll be done. If you prefer to have both WAP's (the one in the primary Router, and the one in the Range Extender), using the same SSID, so that your client devices will connect to the one with the strongest signal simply change the SSID on the second Almond to match the first. If I recall correctly, in "Range Extender" mode both will be identical by default , while if you use the "Access Point" feature (like I do), it will be different (with the appended "_Almond" added to the original SSID), but which you can re-configure to be identical. The Almond doesn't have all the bell and whistles of the upcoming Almond+ product, but I'm sure you'll be satisfied with it. Both "Range Extender" and "Access Point" modes work well. I favour the "Access Point" mode here as it provides better Wi-Fi throughput, as the Radio is dedicated to the Wireless clients, rather than also forwarding packets back to the main Router via Wi-Fi. 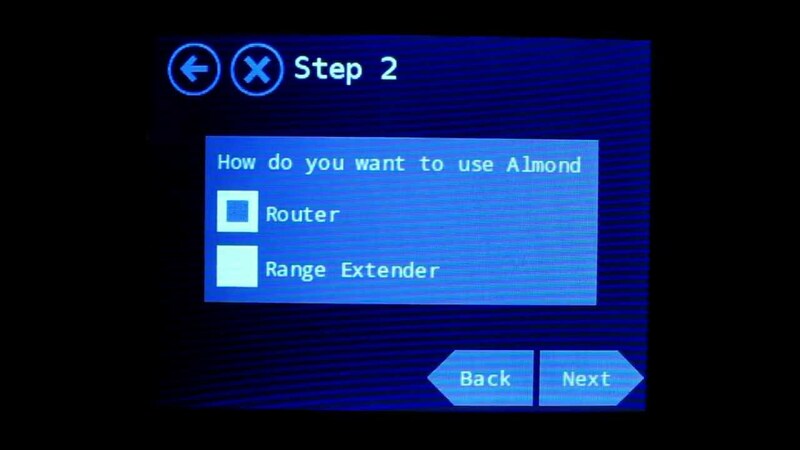 Check out this quick 2 Minute Demo on setting up the Almond as a Ranger Extender. It honestly is as straightforward as you'll see in the video. If you have any challenges etc with the configuration, please feel free to post further messages to the Forum. This is a Community Forum, so you may get assistance from other community members, or one of our staff may answer you directly. Please don't be shy about posting questions.